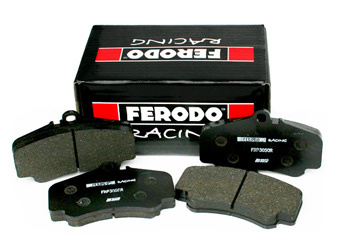 Ferodo is synonymous high performance braking. A long and successful motorsports history stands behind the modern friction technology that Ferodo offers. DS2500 COMPOUND - Our favourite best of both worlds brake pad for high performance street and moderate track day use. The high coefficient of friction µ= 0,5, relatively low dust and noise are difficult to beat. For extreme duty track use, the DS3000 are recommended. The DS2500 compound also works very well on rear calipers when the DS3000 compound is used on the front calipers. DS3000 COMPOUND - Racing compound with a very high coefficient of friction µ= 0,62. Characteristics include high initial bite, decreased pedal effort and consistent torque. The DS3000 compound is not for street use. DS1.11 COMPOUND - A slightly lower coefficient of friction than the DS3000, the DS1.11 was introduced as an endurance compound. Extremely flat torque curve ensures that braking remains consistent at higher temperatures. Lower wear rate makes in an ideal choice for endurance events.